Zak Tools 44, 45 25" Mini Pry Axe FREE SHIPPING! 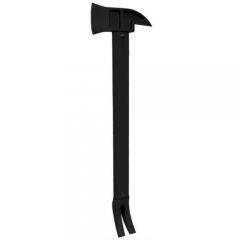 No door will ever block your way while carrying the 25" Mini Pry Axe from Zak Tools. Featuring an ergonomic design optimized for prying application, the pry axe helps users break down virtually any entrance way. A heavy duty axe head delivers the direct impact damage needed to bust through wood, dry, wall and other common construction materials. When brute force does not quite enough to get the job done, a heavy-duty pry claw can be jammed under windows, doors and other surfaces and used to pry them open. The natural curve crowbar's claw maximizes the user's leverage in order to provide pry power many times stronger than user. This allows operators to crank open doors much heavier than themselves. The entire tool is heat treated to ensure long lasting durability that will not break, snap or bend. Does the shaft of the forks separate from the axe handle and head in order to have a striking tool and a prying tool? This is one solid tool and it cannot be separated. ©2002-2019 CopsPlus.com: Zak Tools 44, 45 25" Mini Pry Axe FREE SHIPPING!